Notify me of updates to Midnite Solar Pre Wired SMA Sunny Island-6048 120 vac Inverter for Off grid or Battery based Grid Tie. 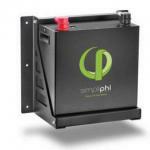 6000 watt 48 volt inverter. Midnite Solar Pre Wired SMA Sunny Island-6048 120 vac Inverter for Off grid or Battery based Grid Tie. 6000 watt 48 volt inverter. 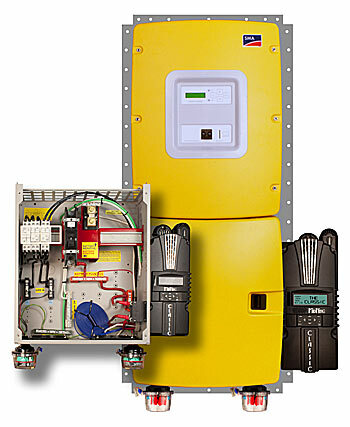 MidNite Solar pre-wired inverter systems offer a turn key solution to installing a battery based inverter system, saving you time in the field. With a pre-wired solution all of the confusion is taken out of selecting all the right parts. This system uses the SMA Sunny Island inverter that is rated at 6,000 watts and uses a 48 volt battery. It produces 120 volts AC and has a single AC input. MidNite does offer an automatic transfer relay that can be installed in the E-panel that will allow the Sunny Island to automatically select between two AC inputs (For example the grid or generator). Dont forget to look at our other products that compliment the pre-wired inverter system like our Battery Boxes or Disconnecting Combiners. Our pre wired systems can be configured in about any way needed with any of the common battery based inverters (except Outback). Please contact us for a quote if the System you need is not listed. Below is a simple list of the major components included in the system. 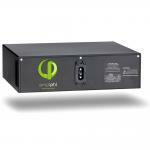 Description: Pre Wired SMA Sunny Island-6048 120 vac Inverter for Off grid or Battery based Grid Tie.